I tried out the new Rausch Shampoos. They are without perfume and free of preservatives and dyestuffs. In fact its for highly sensitive scalps. The first thing I recognized, was that there is no existing odour like I'm used to from other products. You can smell a tiny little scent, but its really very soft. An extra plus of this shampoo is the texture my hair has got after washing it with Rausch Herzsamen Shampoo. Some shampoos let my hair feel very heavy and it's difficult to get the hair completely dry, because it feels like you couldn't wash everything out. But with Rausch you really feel the difference, and your hair feels light and free of additives. So if you like to treat your hair and scalp with a very soft shampoo or if you do have a very sensitive scalp, I would recommend the Rausch Herzsamen Shampoo to you. On the left you can also spot a moisturizing body lotion on the picture.The lotion is very nourishing and has got a very delicate scent. 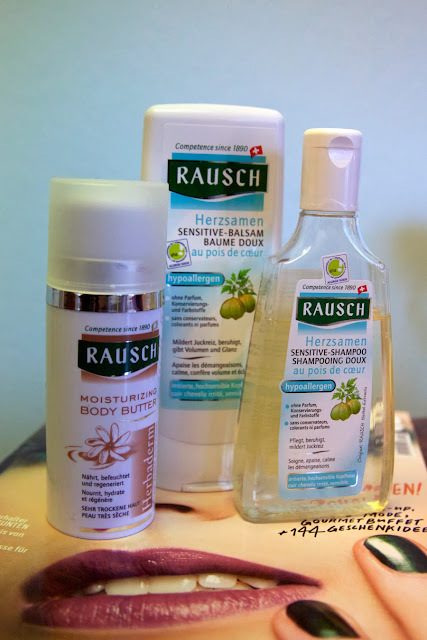 And a very important fact for me as a swiss Fashion and Beautyblogger - Rausch is originally from switzerland. So yeah.. I think this is very cool. To have some great brands from your own country.